But this year, “gods of baking” were on my side :). In the middle of January on Pinterest, I found a beautiful recipe for Cream Filled Chocolate Heart-Shaped Cakes and I knew that was “it”. These small chocolate hearts looked so sweet that there was simply no need for any further research. 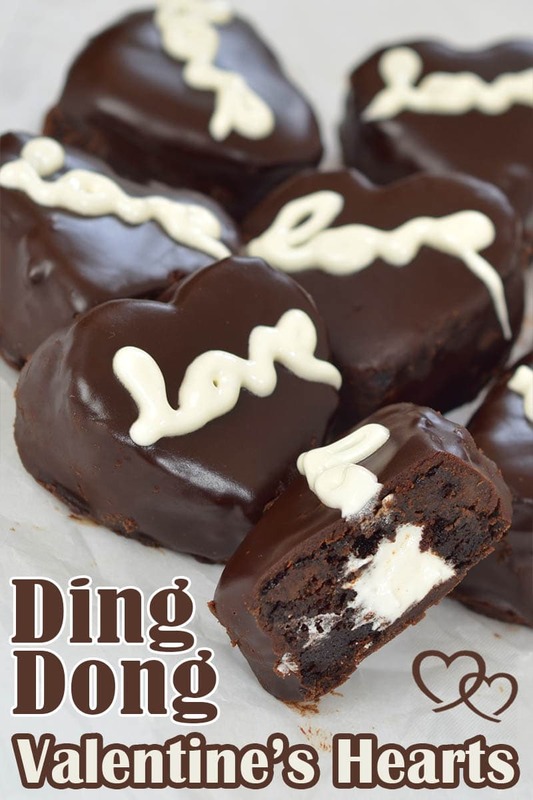 And when I saw that the whole Valentines Chocolate Hearts recipe is a version of the “Ding Dong” cake that we all just love, things were crystal clear. And so, a few days ago, I found my old cookie cutter in the shape of a heart and full of enthusiasm, started making my Valentines chocolate hearts. And everything started off just fine, until the moment I was supposed to pour chocolate icing on the small hearts. My “gods of sweets” turned their backs on me and even though I did everything as it was written in the recipe, the icing was so thick that there was no chance the hearts would be perfectly smooth and beautiful. On the contrary, they looked so unsmooth that I felt sad looking at them. “Maybe you should make a sacrifice for your “baking gods” said my husband, obviously making fun of me. “OK, I will be the victim and I will eat some of your unsucessful hearts”, said Darko while laughing out loud and munching one of my cookies. I decided to try once more with icing, but to increase the temperature in which I will melt the chocolate! Bingo! The chocolate was now thinner and I was beginning to get perfect little hearts! But, soon I had a new problem. 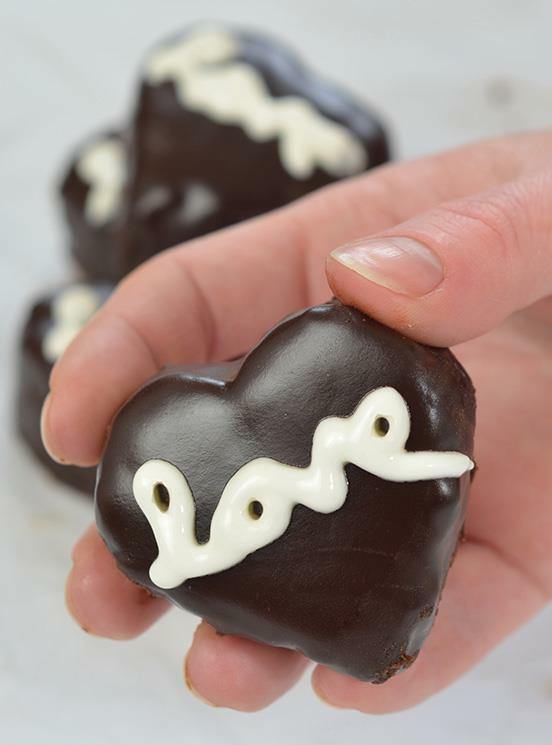 I had one last bag with which I was supposed to make the word “love” with a 7 minute meringue frosting over the chocolate, and I cut it just a little thicker than I was supposed to. And so, the word “love”, which was supposed to be tiny but clear, was like a white stain over my perfect Valentines chocolate hearts! “I told you I should have sacrificed a few more hearts, but you drove me out of the kitchen”, said my husband in his usual frivolous way, while I was desperate in my troubles. But, life goes on. There was no going back and in the end, I decided to make a few photos of my Valentine’s recipe for this year. All in all, it was not as bad as it looked in the first moment. But, whatever the look of chocolate hearts was, the taste was great! Well, if you ever tried Ding Dong cake or Hostess Cupcakes, then you know what a treat this is. And another problem was that my husband ate all of the hearts very quickly so I was out of Valentine dessert. Preheat the oven to 350 F. Spray with cooking spray 9-inch round cake pan (or square 8×8 inch pan), line with parchment paper, and spray the paper with cooking spray and set aside. Yum! I love regular Ding Dongs but these look so much tastier, and cuter too! OK… for a chocoholic like myself, these look absolutely heavenly! 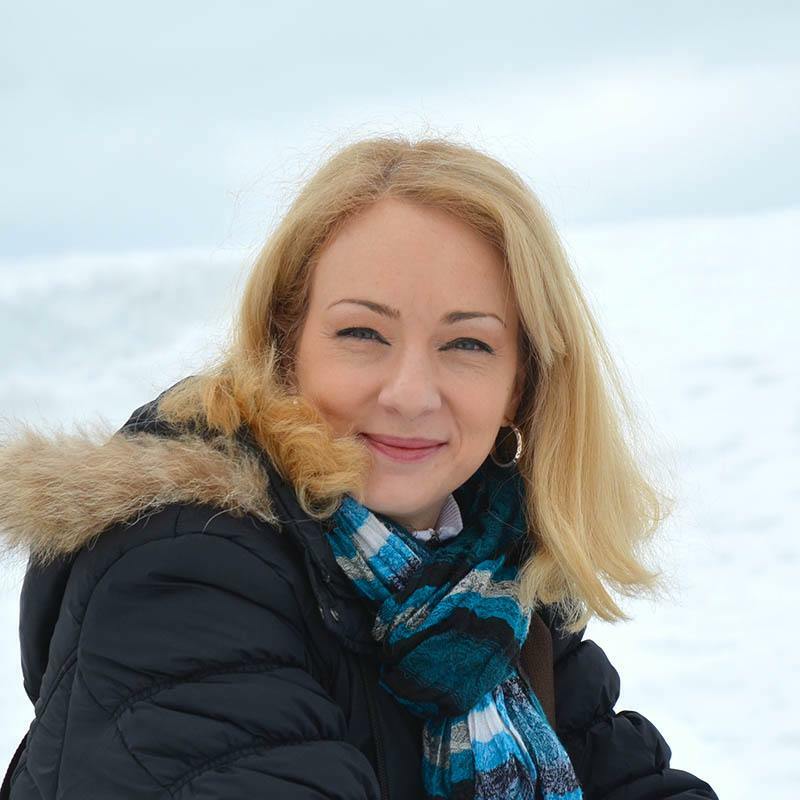 Thanks for linking at Share it Sunday!! Pinning this! is it really 300F ? and not 350F? These little hearts look delicious and so so cute! Pinned! So glad to have you over at Saturday Night Fever Recipe Link Party. I hope you’ll link up again this Saturday at 6pm PST!! I will link up for sure, I love your parties. hi, these look great! is there something else i could do instead of the coffee? like hot cocoa . . . ??? Hi Emily, just skip the coffee,it will be OK.
For the Ganache it calls for cream, Butter and chocolate. But in the directions to make the Ganache I don’t see where to use the butter. Please help ! Or am I crazy ? I can’t wait to try this recipe ! Hi Renee, my mistake, thanks for let me know,combine butter with heavy cream and bring to boil together, then pour over the chocolate. This recipe sounds good, but I can’t have buttermilk. Is there something I can use instead??? Hi Lisa, if you don’t have buttermilk just add 1/2 teaspoon destilated white vinegar or 1/2 tsp. lemon juice to 1/2 cup regular milk and let it sit 5 minutes then use it like buttermilk for the recipe(it’s homemade substitute for buttermilk). I made a few adjustments. I used dark chocolate cocoa. I also let the filling ingredients come to room temperature. The first few times were flat and warming it up first made a huge difference. Is it really only 1 oz semi-sweet chocolate, chopped? Hi Renee, yes it’s only 1 oz chocolate because the recipe use cocoa powder, too. These are EVERYTHING! They look SO good! This was amazing!! My husband said to only make this chocolate cake from now on. Just curious if 330 to bake them at is right and not 300 or 350F? I’ve never baked a recipe that called for 330f? Sorry, I’ve just corrected it. It’s 350 F.
Just last question, for the cake is it just one egg? in your directions you wrote “eggs”.